JUST VEGGING OUT: What is Tempeh and Why Use It? One of my favorite ingredients to use is tempeh. 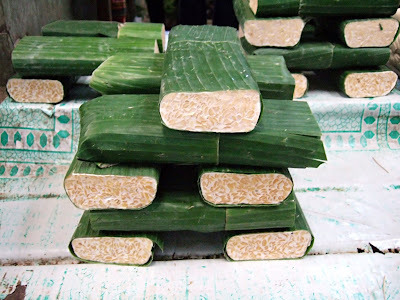 Tempeh originated in Indonesia. It consists of cooked soybeans (tofu is made from soy milk) that have been fermented and pressed into a cake. It is high in protein and is often combined with rice or other grains, which gives it a nutty, somewhat chewy, consistency. Tempeh is often used in vegetarian cooking for its meat-like consistency in such dishes as BBQ tempeh "wings" or tempeh "meatloaf." I tend to purchase the three-grain tempeh because I love the nuttiness that comes from the barley, millet, and the brown rice. What I like about tempeh is its versatility. Like tofu, tempeh takes on whatever flavor you cook it in. On the subject of flavored mock meats, I suspect it is too late for me to cancel my online order for dehydrated textured vegetable protein chunks, seasoned to taste like chicken. I ordered a jug of these TVP chunks shortly before my experience last week with the mock beef strips. Money meet toilet. Toilet meet money.